Megan is an associate in the Firm's Litigation Group, concentrating her practice on complex commercial litigation. 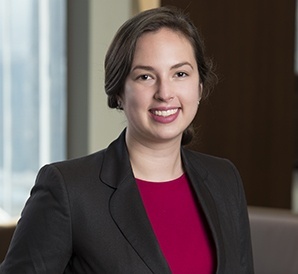 Prior to joining Barack Ferrazzano, she was a litigation associate at an international law firm in Washington, D.C. where she was assigned to the FCC and FTC practice teams focusing on the commercial litigation requirements of clients with special regulatory needs. While attending law school, Megan was a legal intern at the Federal Criminal Justice Clinic, where she advocated for indigent clients charged with federal crimes in the Northern District of Illinois. In addition, during the summer of 2012, Megan served as a legal intern with The Lawyer's Collective HIV/AIDS Unit for the U.N. Special Rapporteur on the Right to Health, in New Delhi, India.